A viral video, campaign, message, infographic, etc., is not quick. It’s not a given. And it’s not always (read: rarely) the one-stop fix for every business problem. As a savvy marketer, you probably already know this. You’re probably the one whose heart stops when “let’s do a viral video!” is shared excitedly (then reaffirmed multiple times) in a brainstorm. But did you know you can influence how viral your message is? How to make your message stick. It’s definitely worth a full read (make sure you stock up on highlighters ahead of time), but here are the three primary takeaways I’ll bring with me to every brainstorm, client meeting and project moving forward. Use triggers to make your brand memorable. To help people remember your brand, pair it with a common (yet unique) trigger. Berger uses pop music as an example. Rebecca Black’s “Friday” song was genius, not because the passionate, deep lyrics or incredible, soul-awakening vocals. No, “Friday” was a major hit with more longevity than most pop songs because it paired with, well, Friday. The day of the week is a trigger for her song, and therefore reminds people it’s out there and entices them to share it. Takeaway: Find something your brand can naturally pair with, particularly an everyday or every-week occurrence, and incorporate that into your marketing strategy. For example, Dove could include “You’re beautiful” wall decal quotes in its product packages for women to place on their mirrors as a reminder when they get ready for work in the morning or a night out on the town. That daily time in front of the mirror is the trigger for remembering Dove’s “You’re beautiful” message (and, ultimately the Dove brand) every day. Highlight what people should do to influence action. We’ve all seen those PSAs telling you not to do this, or avoid doing that, in response to negative social trends. But, according to Berger, this could actually make more people want to do that negative action. People want to fit in and feel cool, which usually comes from following the norm and doing what everyone else is doing. So, instead of telling people not to do something that’s popular, he suggests you debunk just how popular that trend is. He shares another example, this time centering on alcohol. Binge drinking on college campuses seems like a major issue, and in many cases it is. And, the fact that it’s so common is actually the reason a lot of students start drinking in the first place. But, one faculty member discovered that far fewer students actually binge drink than expected; it just appears that more do because it’s talked about more than casual drinking. To influence change, this woman started a campaign focusing on how few students actually binge drink, and shared that the social norm is really one or two drinks. The result? Positive. Students want to be like other students, and once they realized most of their peers weren’t throwing up or making awful decisions from drinking every night, they realized they didn’t have to, either. Takeaway: Don’t highlight the negative action you want people to avoid; share how many people are taking your desired action. People inherently like to help others. It’s a great quality for humanity as a whole, and it can be particularly useful for marketers. If you give consumers information that helps them increase efficiency or save money, they’ll want to share it with others. Think about the original video on how to shuck corn in the microwave (highlighted in Berger’s book). It went viral and got picked up widely because it’s just plain helpful. Or, even personally, I’ve spread the word far and wide about Warby Parker glasses because they’re so much less expensive than regular frames, but they still have great quality. They’re money savers, and therefore, they’re contagious. Takeaway: Incorporate unique, helpful information that relates to your brand into your content marketing strategies. Now, this can’t be something you Google then share, because it has to be groundbreaking (like the corn-in-microwave video). If you sell shampoo, is there a “perfect” way to wash your hair so it feels as perfect as it does after a salon visit? Video that – ASAP! This may – and probably should – require talking with the engineers and innovators at your company, because they may have little-known tricks you (and your readers) have never heard of. 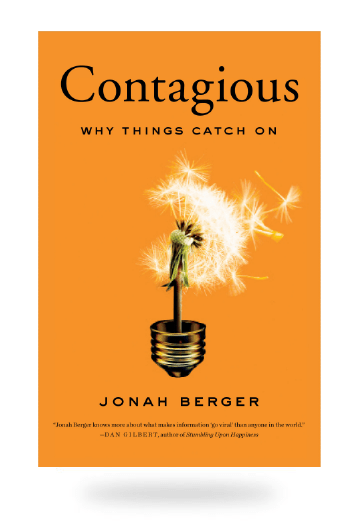 Now, this is only the start to my learnings from Berger’s “Contagious,” and as I’ve said, it’s definitely worth a read. But, if you can’t get to it immediately, follow incorporate these tips into your strategies to help your messages spread, influence action and drive those important business results. This post first appeared on Stephanie Vermillion’s blog, PR State of Mind.